Eyebrows Created By Hand, One Hair Stroke at a Time. The Semi-Permanent Solution to Amazing Eyebrows! We specialize and solely focus on Microblading. At Duluth Microblading Studio, brows are the sole focus. Strictly and only microblading services, each and every day. Trust your face with the best in the industry - your very own PhiBrows Royal Artist from Duluth Microblading Studio! PhiBrows Royal Artist, Julie, 1 of only 300 Royal Artists in the WORLD! Julie also welcomes clients at her second Microblading studio, Minneapolis Microblading Studio, located in the prestigious Minneapolis suburb of Edina, Minnesota. Located in Edina's famed Yorkdale Shoppes luxury shopping district, clients travel throughout the midwest and beyond for their very own brow transformation with Julie. Exclusively following the PhiBrows microblading philosophy of "Perfection is in the Golden Intersection Between Two Differences," hair-like brow strokes are created. Rather than simply guessing, estimating or "eye-balling" the perfect shape of a brow, a special tool is used to accurately measure the exact placement of each stroke. Lastly, digital technology is used to ensure measurements are precise and accurate prior to starting the procedure. We believe in comprehensively taking care of our clients, and exclusively offer a full Microblading package which includes the Full, Initial Microblading Appointment featuring Virtual Technology Precision Drawing Measurement; 4-6 week Touch-Up/Color Boost Perfection Appointment; and PhiBrows-exclusive Aftercare Kit. Whether you are looking to fill in your brows or require a more comprehensive approach, to reshaping or creating new brows, our priority is focused on exceeding expectations in order to make you look and feel wonderful! You are cordially invited to browse our site and see how we can make a difference for you. MICROBLADING is a manual cosmetic tattooing technique that provides the look of natural brow hair. MICROBLADING & SHADING is a technique that combines microblading AND shading to give a more 3 dimensional look, or to better blend natural hair with microbladed hairstrokes. This technique is especially ideal for those with very little to no brow hair, or those with dense natural hair in a concentrated area. The style of microblading performed at Duluth Microblading Studio is exclusively that of the PhiBrows method. Originated in Serbia by the Master of Microblading, Branko Babić, this technique is unsurpassed in the microblading industry. A semi-permanent makeup method of drawing eyebrows where pigment insertion is done with micro blades, it simulates the natural look of hairs with various lengths and densities. In this method, we do not use tattooing machines. Hairs are drawn shallow in the skin with special blades, by hand. Due to this specific method, the natural look of eyebrows is achieved easily. Rather than filling in the entire shape of the eyebrow with pigment (felt pen effect), hairs are skillfully drawn in their natural growth direction. With this technique we do not want to achieve the effect of evening makeup, but rather to correct imperfections and enhance your natural look. Using exclusive PhiBrows mineral pigments free of heavy metals, the pigments are shipped directly from Germany and are vibrant and long lasting. While PhiBrows pigments cost 5 to 10 times more than the average cost of pigments used by other microblading artists, the results produced are unmatched. The supreme PhiBrows pigments assimilate with skin pigments to create a truly natural look. We recommend this to men and women who want to restore their eyebrows to their best possible and natural form. Microblading originated in Asia over 20 years ago and has gone by many names; eyebrow embroidery, feather touch, 3-D brows, 6-D brows, microstroking and even “the Japanese Method." By 2015, microblading became popular in the United States. The size, shape, and thickness of a brow define the delicate features of the face. The most underappreciated and neglected feature on our faces sits front and center, directly above our eyes. The impact brows have on framing the face is truly remarkable. Microblading is a form of semi-permanent makeup that creates natural, beautiful eyebrows with a handheld microblade. It's perfect for men and women who have over-plucked, lost eyebrows due to illness, or those who want to define, darken or reshape their eyebrows. Technically, microblading is a form of eyebrow tattooing. But unlike traditional tattooing, which uses a machine, microblading artists apply each hairstroke with a handheld microblade. This produces a very fine line that resembles real hair. Each individual hairstroke is hand drawn by the artist and blended in with the client’s existing eyebrow hair. With a strong artist at the helm, the results can be gorgeous and very lifelike. The second appointment is a complimentary Perfection/Touch-up appointment completed 4 - 6 weeks after the first session. This allows enough time for the ink in the epidermis to naturally slough off, and the color to settle into your skin. In the touch-up appointment, the artist can see how your skin has received the ink and make any necessary corrections. Sometimes a client’s skin undertones may have unexpected effects on the ink's color, and the artist may need to add color to adjust. These kinds of corrections are normal with any microblading artist and an essential part of the process, as everyone’s skin is different and receives ink differently. Perhaps the single most important factor in ensuring the desired result is achieved through the Microblading process is to choose your Artist wisely. Not all Microblading Artists are created equal. Some Artists receive extensive training, and some learn as they go. Most states require Microblading Artists to be licensed Tattoo Artists; however, simply comparing one licensed Microblading Tattoo Artist to another is not sufficient. For example, in Minnesota, Artists performing Microblading procedures are required to complete 200-hours of a supervised tattoo apprenticeship before being granted a full tattoo license. This 200-hour training requirement is not the same for neighboring states, such as Wisconsin, in which no apprenticeship/training hours are required for licensure. Our Microblading Artist is a graduate of the premier, highly-esteemed PhiBrows Microblading Academy, and have received the prestigious honor and title of PhiBrows Royal Artist. Currently, there are only approximately 300 Royal Artists in the world! The PhiBrows Microblading Academy is the most prestigious Microblading Academy in the world, and only allows those that have demonstrated thorough and precise technique to display the PhiBrows name and symbol. PhiBrows Academy students must pass on-going rigorous training and continue on the course of becoming a PhiBrows Master Artist. 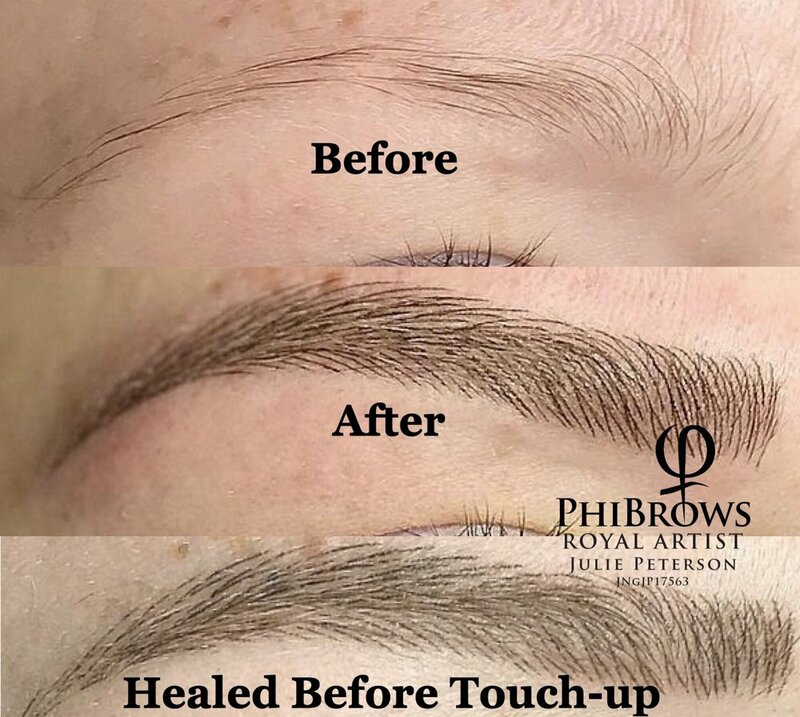 Please research your Artist - The PhiBrows process is approximately 2 hours in length to incorporate a variety of techniques, precision strokes and digital measurements to ensure hyper-realistic results. The same results can not be achieved in procedures lasting an hour or so offered by others offering microblading services. Trust your face with the best microblading method in the industry! © Duluth Microblading Studio. Unauthorized use and/or duplication of this material without express and written permission from this site’s author and/or owner is strictly prohibited.